Introducing Bradford Schools Pest Control for £5! What do we offer your Bradford school? 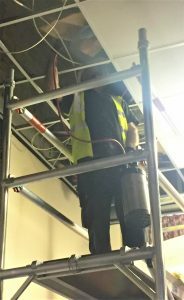 Expertise – here at Premier Pest Control, we protect the premises of a great many schools in the Bradford and West Yorkshire area. Thus we have extensive experience of carrying out pest control in schools in a safe and efficient manner. Speedy service – we are based in Bradford and one of our friendly, local technicians will get to your premises within 24 hours if you have a pest problem. Because we understand the need for discretion, our school visits are often carried out after the school day, on weekends, or during holidays when the children are not there. We are members of British Pest Control Association and National Pest Technicians Association. And we work closely with Bradford Council and are set up on their supplier system. You can call us now on 01274 612559 for more details of our Bradford Schools Pest Control for £5 scheme. Premier Pest Control have had many years of dealing with pests in schools. Our most common call-outs are for rats and mice. Also, we deal with wasps, bees, ants, flies, cockroaches, pigeons, moles, squirrels and foxes. We find pests in classrooms, staff rooms, canteens, kitchen areas, store rooms, school grounds, sports fields etc. So we are experts in dealing with all of these pests! Why are pests so alarming for schools? Your staff would be highly embarrassed to have a pest problem – an infestation can be a devastating PR blow to any institution’s reputation. Your staff and students will be worried if there are pest problems. People expect a clean and safe environment, and need to feel safe in their school. Also, pests can cause disruption to students and staff. Some school areas may have to close down until the problem is fixed, eg school kitchens. In some cases, entire schools have had to close. Recently a Manchester school had to close for 2 days because of rats in the ceilings (https://www.manchestereveningnews.co.uk/news/greater-manchester-news/manchester-school-closed-after-suspected-14040237) and the same happened in Northamptonshire (http://www.bbc.co.uk/news/uk-england-northamptonshire-41845168 ). Both schools had to get professional pest controllers in to solve the problems. Finally, some of these pests can cause serious diseases and health risks, which can be spread rapidly in a busy public setting like a school. We can solve your pest problems, and better still, we can prevent them happening in the first place! You can call us now on 01274 612559 for more details of our Bradford Schools for a £5 scheme.